Provide financial markets with the level playing field and market integrity needed for long-term real economy investments aligned with the sustainable development agenda. 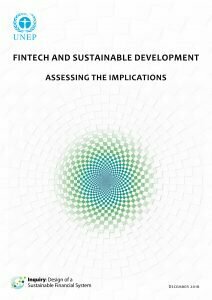 The report also presents an innovative analysis of how advances in three digital technologies – blockchain, machine learning and artificial intelligence (MLAI) and the Internet of Things (IoT) – could lead to revolutionary innovations for building trust, transparency and traceability for financial transactions and make tomorrow’s financial system far more efficient in mobilizing green finance. Ensuring that fintech is an integral part of financial system development plans, particularly at the national level, and especially for developing countries. Establishing a platform of leading fintech companies to influence the right enabling businesses, policies and standards to connect fintech with sustainable development. Incentivizing fintech alignment with sustainable development by, for example, supporting venture capital and social impact funds to fund start-ups with sustainable development ambitions. Creating a challenge fund to create a global community of purpose that can pilot and create replicable solutions over time.